Khaadi organza outfit with embroidery and handwork detailing, paired with pearl infused gharara pants. Thank you , it’s beautiful and I love it. I choosed this dress for my mom and she really loved it. The color is soft pastel and the quality of fabric and workmanship on the dress is the same as per the pictures and description on the website. 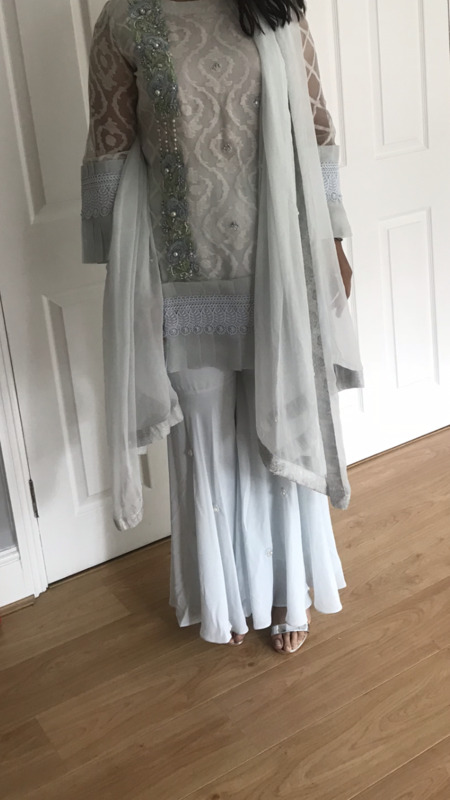 She wore this for a wedding and received a lot of compliments! This is our first purchase and the overall experience was really good, more orders to go soon! Excellent . But I don’t like frill at the bottom and sleeves if some other soft fabric will be used then it’s perfect . Great service and fast delivery.. outfit was very pretty, and nice quality. Look forward to ordering again.